Ever since Suzanne Collins released Mockingjay, her final book in The Hunger Games series, I've been yearning for another powerful young adult book or series that I could introduce to my students. There have been several challengers: the Divergent trilogy by Veronica Roth, The Chaos Walking trilogy (beginning with The Knife of Never Letting Go) by Patrick Ness, the Legend trilogy by Marie Lu, and Daughter of Smoke and Bone series by Laini Taylor (which is amazing, intricate, and geared more toward high school students). But none of them quite topped what The Hunger Games could achieve as far as overall student appeal and engagement. Which is why I was excited to get my copy of Tomi Adeyemi's new book Children of Blood and Bone last week. It had been touted as one of the most anticipated new young adult books by Publisher's Weekly. I was not disappointed. 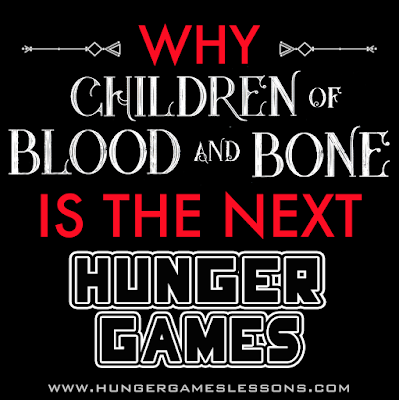 Like The Hunger Games trilogy, Children of Blood and Bone features a strong-willed female teenage protagonist with the weight of the world on her shoulders. And like Katniss, Zélie and her family have been the victims of a tyrannical ruler who is hell-bent on keeping them down. Zélie, as well as Amari and Inan (the other narrators), experience some of the same insecurities, fears, and conflicting feelings Katniss went through--and definitely feelings teens can relate to. It is the first book in the Legacy of Orïsha trilogy. Unlike The Hunger Games, Children of Blood and Bone is set in the fantasy world of Orïsha, which is based on the West-African country of Nigeria. In fact, the names of the villages in the novel are the same as real places in Nigeria. West-African mythology is beautifully woven into the story that it immerses the reader with its magnificence. 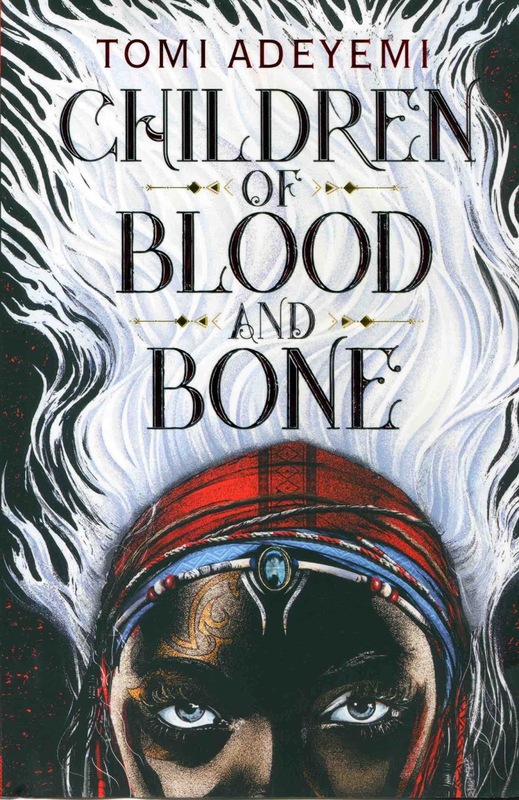 Also, Children of Blood and Bone is narrated by three separate characters, all in first-person. Readers are able to see events from two very different perspectives from Zélie's. Having the contrasting viewpoints helps the events in the plot flow, while at the same time giving readers new insights and a deeper understanding of the characters and their motivation. 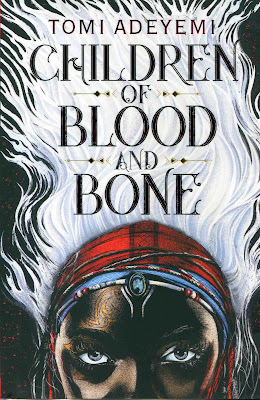 But what makes Children of Blood and Bone so special is that its characters--including all the main protagonists--are people of color, something that has been missing from many popular young adult series. Too often in fiction the characters of color must rely on the white character to fight the injustices or come to their rescue (i.e. To Kill a Mockingbird, The Help, Their Eyes Were Watching God). Now, more than ever, students need to see diverse heroes in literature; ones that are able to overcome obstacles without the help from a white character. 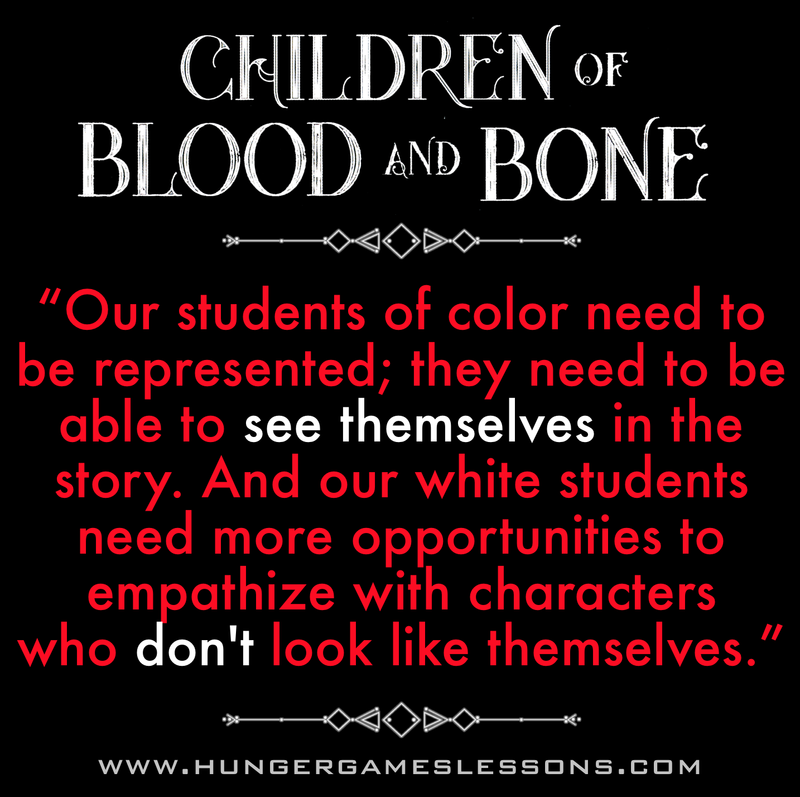 Our students of color need to be represented; they need to be able to see themselves in the story. 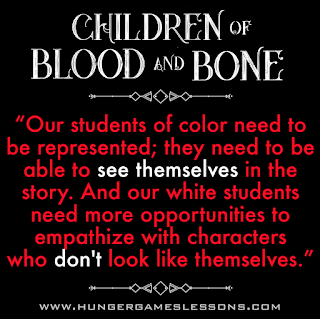 And our white students need more opportunities to empathize with characters who don't look like themselves. 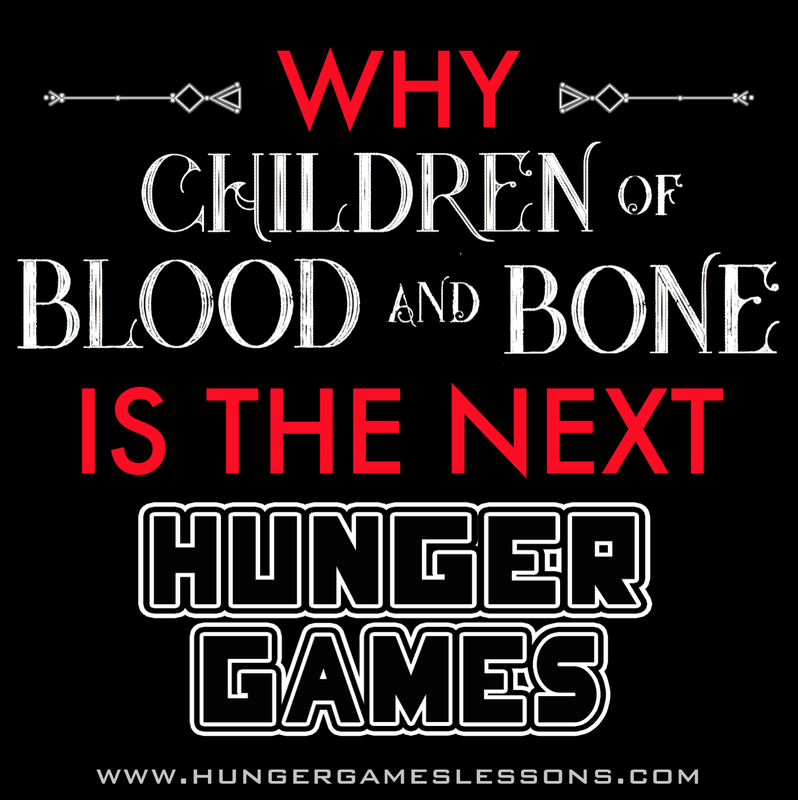 Children of Blood and Bone succeeds at both. Adeyemi writes in her "Author's Note" at the end of the novel that she was deeply inspired by the terrifying events of police shootings and brutality in America over the past several years. Though the novel is set in a fantasy world, the ruthlessness and violence by those in power emphasize the themes of racism and fear. Caitlyn Paxon, NPR.org, writes in her review that "...Adeyemi has created a powerful metaphor for the cruelty of racism and the way that it weakens and divides a country." While reading it, I couldn't help comparing the narrators to Katniss (or other teen protagonists). While there were many similarities, there is something about each of the narrators that is raw, utterly emotional, and unique from any other teen series. I truly believe that experiencing the suffering through these characters gives so much more weight and heaviness than through their white fictional counterparts. Perhaps it's because deep down we know this isn't just a fantasy--the pain these characters feel mirrors the pain suffered by many every single day in real life. Which is why I believe this novel--and hopefully the entire series--is the next Hunger Games. • Teachers will find multiple ways to relate the novel to current and past events; there are several instances where comparisons can be made with the slave trade, lynchings, the Holocaust, the nuclear arms race, police brutality, the #BlackLivesMatter movement, and gun violence/mass shootings. The novel also offers excellent talking points about stereotypes, gender roles, and class inequity. (I'm a Connector, which I think is pretty accurate. :) Comment below with your Clan.) Hopefully more will be added to the site as the popularity increases (which I'm sure it will). • This is the first novel in the Legacy of Orïsha trilogy, with the second book to be released in 2019, the third book in 2020. Fox 2000 has secured the movie rights a year ago (!) and it is currently "in development." A release date has not been set.